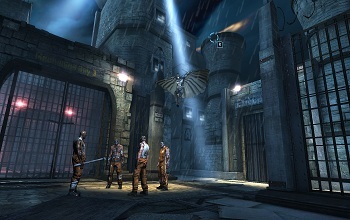 Batman: Arkham Origins Blackgate will let players choose the order of the game's boss battles. Despite working on what many might consider Batman: Arkham Origin's smaller sibling, Armature Studious, the developer behind Batman: Arkham Origins Blackgate, is striving to create a title that lives up to the console games while also establishing itself as a unique and worthwhile experience. Speaking about the game, director Mark Pacini revealed that one of the ways they're doing this is to expand on its flexibility by letting players take down the game's bosses in whatever order they choose. "It's more akin to how Mega Man used to do it," he explained. Rather than forcing the player down a set route, the game will instead let them forge their own path. This can potentially lead to different experiences depending on where players go and what items they collect first. Boss battles, for instance, can play out differently depending on what you have with you. Different items can expose different weaknesses and ways to explot them. To help maintain this flexibility, the game's narrative, in turn, will be made up of connected "micro-stories" that, in the end, add up to a larger plot. Pacini hopes that this freedom will help to make up for some of the simplification that Armature has to do to accommodate the 3DS and Vita, as well as the game's 2.5D perspective. "The challenge there was that we didn't want to make the game overly complicated by forcing things into the game that didn't necessarily need to be there," he said. "What we wanted to do was take the core of the Arkham games, the free flow combat and gadget use, and take that over but put it in a different context." The importance of translating these mechanics well isn't lost on him. "If we didn't get those right...It would just be a game starring Batman. It wouldn't be Arkham."